Temperature is one of the basic elements of weather. Our perception of it, however, is often influenced by other factors. In summer, this is usually humidity. The heat index, developed in the late 1970’s, is a measure of the apparent or “real feel” temperature when heat and humidity are combined. Since the human body relies on the evaporation of perspiration to cool itself, the moisture content of the air affects comfort levels. Basically, as humidity levels increase, the rate of evaporation decreases and the body can begin to feel overheated. For example, an air temperature of 92°F combined with a relative humidity level of 60% will produce a heat index value of 105°F. 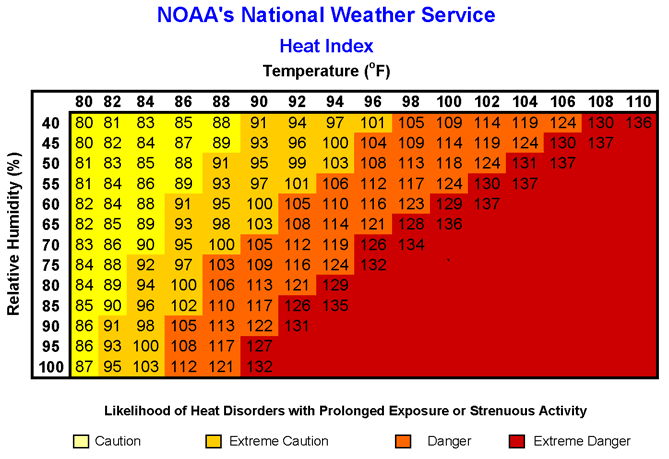 The National Weather Service issues heat advisories when the heat index is forecast to be at least 95°F for two consecutive days or 100°F for any length of time. Extended exposure to high heat index values can lead to serious health hazards. This entry was posted in weather and tagged health, heat, lingo, summer by Melissa Fleming. Bookmark the permalink.